Maine Department of Inland Fisheries and Wildlife Commissioner Chandler E. Woodcock speaks during a press conference announcing a broad coalition of groups that oppose a proposed referendum that would outlaw the hunting of bears by hound, trap or bait in Augusta on Monday, Sept. 22, 2013. Don Kleiner, executive director of the Maine Professional Guides Association (left), wildlife biologist Jennifer Vashon of the Maine Department of Inland Fisheries and Wildlife, DIF&W commissioner Chandler E. Woodcock (partially obscured) and Sportsman's Alliance of Maine executive director David Trahan listen to a question during a press conference announcing a broad coalition of groups that have banded together to oppose a proposed bear hunting referendum in Maine. AUGUSTA, Maine — Weeks after animal rights groups announced that they’d seek a referendum that would ban hunting bears with hounds, traps or over bait, those who support the state’s bear hunting status quo unveiled their own coalition on Monday during a press conference outside the Maine Department of Inland Fisheries and Wildlife office. All three official gubernatorial candidates for the 2014 election, six candidates for Maine’s seats in the U.S. House of Representatives, more than 20 organizations and labor unions, and nearly 80 sitting Maine senators and representatives from both sides of the political aisle support the existing hunt and defend its role as a management tool. Woodcock said Gov. Paul LePage is among those who oppose the proposed referendum, which is expected to be on the November 2014 ballot. According to Woodcock, both he and LePage expect Department of Inland Fisheries and Wildlife biologists to play a key role in the debate. Over the summer, citing the failure of Maine’s legislature to take any action that would change the way bears are hunted in the state, the Humane Society of the United States and other groups banded together to propose another referendum. The resulting group, Mainers for Fair Bear Hunting, says that the state’s current practices are cruel and unsporting. Late last week, referendum opponents announced the formation of the Maine Wildlife Conservation Council and the hiring of James Cote as its coordinator. David Trahan, executive director of the Sportsman’s Alliance of Maine, said that efforts to defeat the proposed referendum are far ahead of similar efforts made a decade ago. He praised the willingness of politicians, business owners, and sportsmen and women to step forward and share their opinions. 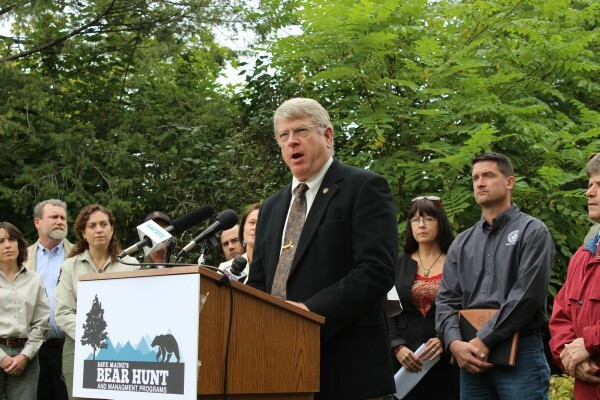 Trahan blamed the Humane Society of the United States for the referendum effort and pledged support for the state’s wildlife biologists. Trahan also told the assembled crowd that an uncontrolled bear population could create hazards for people and would have economic impacts on parts of the state that are already struggling. “The proposed referendum threatens rural economies and our hunting heritage and undermines the expertise of our tremendous biologists at the Maine Department of Inland Fisheries and Wildlife,” Trahan said. 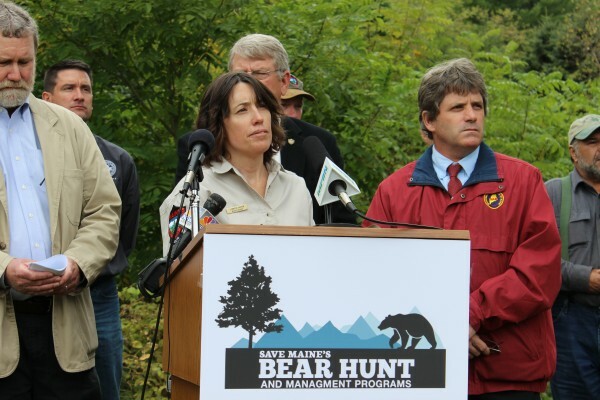 Don Kleiner, the executive director of the Maine Professional Guides Association, said the annual bear hunt is an essential economic engine that his membership depend upon.